After reviewing the documentation, the purported McDonalds employee accepted me (and my family) as a customer, and left us to place our order. In what follows, I will refer to this person as "Possible Witness 1". We ordered two Ranch Wraps, one burger, and one mango McFlurry, from a cashier who I will refer to as "Possible Witness 2". My daughter handled the cash to pay Possible Witness 2, as my daughter wanted to practice her French. Possible Witness 2 complimented my daughter on her fluency in French. Next my family and I seated ourselves in the restaurant right by the entrance, so we could watch people walking along Avenue Champs Elysees while we ate our meal. Subsequently another person within McDonalds physically assaulted me, while I was in McDonand's, eating my McDonald's Ranch Wrap that I had just purchased at this McDonald's. He angrily grabbed my eyeglass, and tried to pull it off my head. The eyeglass is permanently attached and does not come off my skull without special tools. I tried to calm him down and I showed him the letter from my doctor and the documentation I had brought with me. He (who I will refer to as Perpetrator 1) then brought me to two other persons. He was standing in the middle, right in front of me, and there was another person to my left seated at a table (who I will refer to as Perpetrator 2), and a third person to my right. The third person (who I will refer to as Perpetrator 3) was holding a broom and dustpan, and wearing a shirt with a McDonald's logo on it. The person in the center (Perpetrator 1) handed the materials I had given him to the person to my left (Perpetrator 2), while the three of them reviewed my doctor's letter and the documentation. After all three of them reviewed this material, and deliberated on it for some time, Perpetrator 2 angrily crumpled and ripped up the letter from my doctor. My other documentation was also destroyed by Perpetrator 1. I noticed that Perpetrator 1 was wearing a name tag clipped to his belt. When I looked down at it, he quickly covered it up with his hand, and pulled it off and turned it around so that it was facing inwards, so that only the blank white backside of it was then facing outwards. Perpetrator 1 pushed me out the door, onto the street. Ironically, it was because of the assault that Mann was able to capture images of the McDonalds employees. 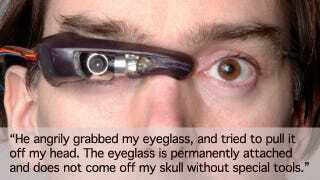 The Eye Glass utilizes a system called "Augmediated Reality" which helps the wearer see better. When the computer is damaged, buffered pictures for processing remain in its memory and are not overwritten. Subsequently, Mann was able to capture images of the assault. Mann contacted police after the incident, but "did not receive much help from them." He is hoping that the fast-food chain will repair his broken Glass, and that "McDonalds would see fit to support vision research." The assault has already enraged a number of people who are calling for an immediate apology. Users on Reddit have been quick to act, going so far as to publish the address and phone number of the McDonalds in question, while Techcruch has called for a McDonald's boycott. According to Andy Greenberg of Forbes, McDonalds has assured him that, "that the company "[takes] the claims and feedback of our customers very seriously. We are in the process of gathering information about this situation and we ask for patience until all of the facts are known." Mann is no stranger to controversy — nor to discrimination. He was once thrown out of a Wal-mart, and has had run-ins with the New York City Police department and U.S. Secret Service. Images via Steve Mann and CBC.